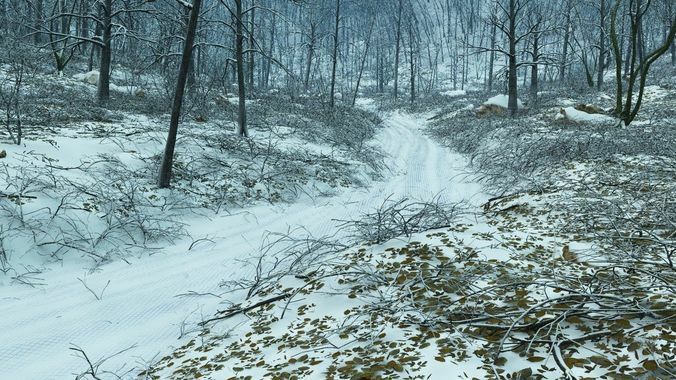 There is a path within a cold and bare forest, covered with snow but still visible, this is the theme of the scene. Always consider it as a basic environment for your scenaries and animations. Notes: The scene include 2 terrains (1 terrain and 1 road), both modeled in World Creator 2 and texurized in Vue. They were populated with 6 eco-systems, all adjusted for this kind of terrains. Dead Tree For the Vue Infinite/xStream users, they are already in bundle. Attention: you need release 7 of Vue or higher and versions xStream, Infinite, Complete, Exprit. This scene is available only in vue format. Packlist: 1 Vue scene, 2 alpha-mask, 1 eco-material, 1 readme.pdf. The file zipped is a multi-volume of 4 parts, you have to download all of them to open correctly the file.